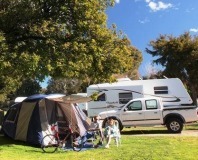 Mawley Holiday Park, Masterton, Wairarapa. Information, Photos and Reviews. Fully refurbished in 2012, Mawley Park is the perfect base from which to explore everything Masterton and the beautiful Wairarapa has to offer. We have a range of clean, quality, accommodation – cabins through to en-suite units, power/non-power sites. Three minutes’ easy walk from Mawley Holiday Park is Masterton’s recreation precinct and CBD– with beautiful QEII Park, adventure playground, heated indoor and outdoor pool complex with hydro-slide, skate park, museums, mini-golf, ten-pin bowling, cinema, cafes, restaurants, shops and so much more!! Nobody has reviewed Mawley Holiday Park yet, Be the first. You are submitting a booking enquiry. Mawley Holiday Park will then contact you by email with details of availability and prices.